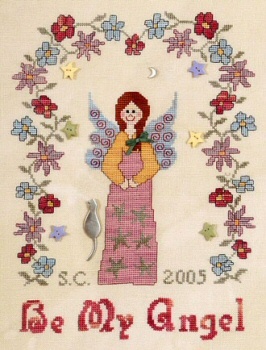 My daughter Sofia has designed this joyful angel for a special and joyful young woman, Valentina Giumelli. The cat and the moon charms are based on original design of Valentina and crafted by our friend Rosella. Valentina’s life was interrupted at the age of 26 by a frightening flight crush in Linate airport, Milano, Italy, on October 8th 2001. She was going to Denmark to complete her thesis for the degree in Engineering, but her life ended on that day with all her happiness and hopes. Her parents, Serena and Claudio have collected her designs, greeting cards and collages in a special book and it is amazing to see how from simple paper and colors she could create so much, always with a happy heart. In these last years her parents have dedicated their hearts and souls to organize cultural events, raise funds and create scholarships dedicated to her. A non profit association “pro Valentina Onlus” was created in 2002, to help people in need and promote cultural events in her memory. Many things were done to remember this beautiful and gifted young woman, and this little Valentina’s Angel is a token of love from an eleven-year old girl to a beautiful angel in Heaven. I want to thank my daughter Sofia for the happiness and beauty she was able to represent in her design, so warm and full of colorful life and love. Her design is not only dedicated to Valentina Giumelli, but also to young generations and children. With the same spirit of Valentina’s parents, all net proceedings of this pattern will be given for charity purposes. Stitches Cross Stitch, Back Stitch.